In Remembrance of the men of the British, Canadian, ANZAC & Indian Expeditionary forces that lost their lives 100 years ago in Flanders and Gallipoli. When war broke out, men of the Punjab were first to land in Europe to reinforce the British Expeditionary Force (BEF) in Flanders. In October 1914, the Kaiser had taken direct aim on the town of Ypres and the port of Calais, calculating by destroying the British force he would be able to take France quickly out of the war. His grand scheme had not factored in the Punjabis – the Lahore Division as fate would have it arrived in the nick of time to reinforce the BEF taking up 1/3 of the British line. In the words of Major Gordon Corrigan, author of ‘Sepoy in the Trenches’ and guest speaker on our 2014 Remembrance Day public lectures – the Indians “saved the British Expeditionary Force from annihilation in 1st Ypres.” The first German offensive on Ypres was defeated. On 25th April 1915, the Allies launched an assault on Turkey’s Gallipoli peninsula with the aim of advancing onto Istanbul to take Germany’s key ally out of the war. Amongst the attacking force were 15,000 Indian infantry and artillery men. The ill-fated attempt was a disaster, all told casualties amounted to nearly 25,000 British and Irish, over 7,200 of the Australian units, more than 2,300 of New Zealand’s forces, and more than 1,500 members of the Indian Army. April 25 is commemorated every year down under, as Anzac Day. Celebrating the “Anzac spirit” of endurance, the festivities annually etch the sacrifices of Australians and New Zealanders at Gallipoli into national consciousness as the cornerstone on which their nations are built. If you were to cut through the fog of time, you find Punjabis along with Ghurkas campaigning gallantly amongst their Anzac brothers in the thick of the fiercest fighting at Gallipoli. A Times of India report of 1915 detailed how the 14th King George’s Own Ferozepor Sikhs led a gallant charge uphill against well entrenched Turks. They took the trenches but lost over 80% of their battalion in the action. “The Sikhs & the Ghurkas were professional soldiers, at times they were the only ones that knew what they were doing” reported the good Major at our Vancouver Remembrance day community lecture last November. “The country to be crossed was open, and devoid of cover; for the first 500 yards, it rose slightly to a crest, thence dipping for another 500 yards, and ascending in a glacis-like slope to the German position. Units had only the vaguest idea as to the position of their objective. Our Artillery fire was meager and ineffective, the Gunners having no better information than us as to the objective. “The position of assembly was some 1500 yards from the German trenches, which were on a ridge, the ground over which we had to advance was practically bare of all cover and completely commanded by the ridge, about the last 500 yards being up a slope, during this time a very poor bombardment had been carried on at the German trenches. The Lahore Division was employed as a whole, or by brigades, from 26th April until the 1st May in holding the Canadian portion of the frontline. In doing so, the Indian Corp lost in killed, wounded, and missing, 133 British officers, 64 Indian officers, 1620 British and 2070 Indian rank and file a total of 3887 all ranks, or 30 per cent of the infantry strength engaged. The Canadians were clearly cast as heroes. But who exactly were the ‘slave soldiers’ of the British Indian Army, foolishly throwing away their lives so far away from home in a conflict not of their making? These men were heroes answering the call of duty and upholding their personal, regimental and country’s Izzat /Honour ( WW1 was at the time widely supported across India). However, the gallantry and sacrifices of the Indian Army have never been fully dignified in remembrance and so their efforts have been open to muddying by political agendas. Post 1947 independence politics of India & Pakistan, and ‘well’ meaning left leaning academics in the West, railing against the vagaries of colonialism would have us believe that cowering Punjabi men were shepherded in their droves to the mouth of the canon in an imperial conquest. This is a disservice to the honourable and brave men of the British Indian Army , whose actions, if you care to discover them, reveal volumes about them and their motivations. Our previous posts have covered the unique insights into their lives & motivations afforded by the censor’s letters – a fundamental belief that Germany’s war mongering threatened King & Crown, rallied their fervent support in the ‘Great War for Civilisation’. By every measure these were honourable men and gallant soldiers; wherever duty called, the Indian Corp fought bravely, upholding the ties of loyalty to the Crown and the bonds of brothers on the battlefield. Their actions won 21 Victoria Crosses (VC) during WW1. In addition to the prestigious VC, many Indian soldiers were also awarded decorations such as the Military Cross, Order of British India, Indian Order of Merit, and the Indian Distinguished Service Medal. In total over 9,000 gallantry awards were made to the Indian Corp, Indian men upheld their Izzat and that of India day in day out through some of the darkest chapters of the Great War. Today, let us honour the deeds of courage on one such day, April 26th 1915. Jemadar Mir Dast, I.O.M., 55th Coke’s Rifles (Punjab Frontier Force), attached 57th Wilde’s Rifles (Punjab Frontier Force)For most conspicuous bravery and great ability at Ypres on 26th April, 1915, when he led his platoon with great gallantry during the attack, and afterwards collected various, parties of the regiment (when no British) Officers were left and kept them under his command until the retirement was ordered. Jemadar Mir Dast subsequently on this day displayed remarkable courage in helping, to carry eight British and Indian. Officers into safety, whilst exposed to very heavy fire. Mangal Singh received his award for gallantry during the 2nd Battle of Ypres, on 26th April 1915: “On recovering consciousness after being gassed, in spite of intense suffering, he went out time after time and helped to bring in the wounded under fire”. Mangal Singh was a native of Amritsar. Awarded for gallantry during the Second Battle of Ypres on the 26th April 1915. “Atma Singh, one of a machine-gun detachment, helped to bring a gun up to near the firing line and got it into position under a hot fire. Here he held on until the front line was driven out by gas but he himself declined to budge until lieut Deeds ordered him to retire.” Atma Singh was a native of Lahore. “On April 26th, 1915 during the 2nd battle of Ypres Sucha Singh took command of his company when all the British Officers were killed or wounded.” Sucha Singh was a native of Lahore. 100 years ago, gallant actions such as these on 25th & 26th April, spread across 2 critical theatres of war were unparalleled. 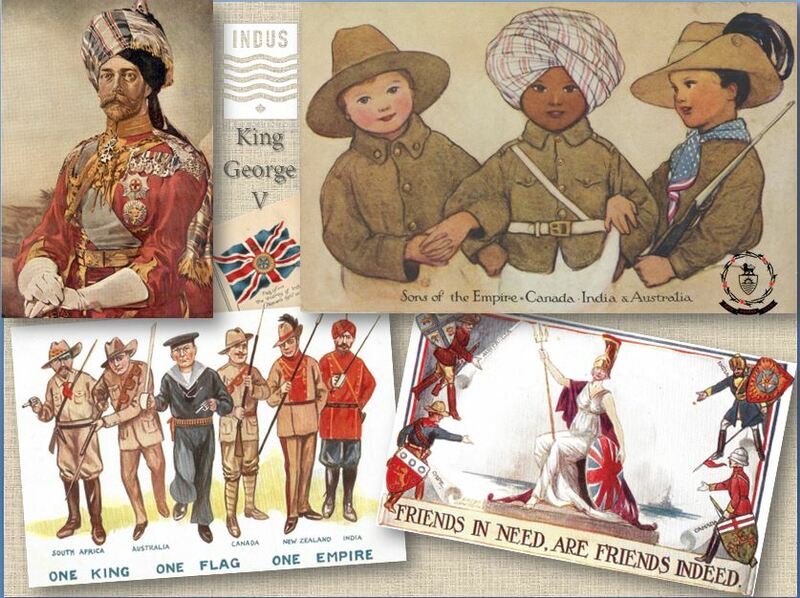 After all, what single community can claim to have had the ‘back’ of Britain , Canada and Australia during these critical do-or die moments early in the war – only the Punjabis; they were there at the moment of need, as sons of Empire, brothers in arms and friends in need. For that, they should be remembered.